The Crested Butte Land Trust hosted the second of two visits to Meridian (Long) Lake on Friday, August 24 to inform the public about its efforts to acquire the public property in the near future and begin managing it for recreation, wildlife preservation, and agricultural preservation. The visits, which included about 40 people total, kicked off a public comment period from the US Forest Service (USFS), the first step in the process of a land swap where the land trust would contribute 613 acres of land it owns in the Fossil Ridge area northeast of Gunnison in exchange for the 120 acres of National Forest land that includes eastern and southern parts of Long Lake. The Land Trust would also contribute a 15-acre parcel on Copley Lake, west of Crested Butte, to the swap. The result of the exchange is that the Land Trust will begin managing the Long Lake parcel, saving it from vulnerability to development, since the USFS is ready to dispose of it. The USFS wants to sell it because the size of the parcel is too small to be managed efficiently on the scale within which the USFS works. The visits each began by meeting in the town of Crested Butte, where a shuttle provided transportation to the trailhead parking area. 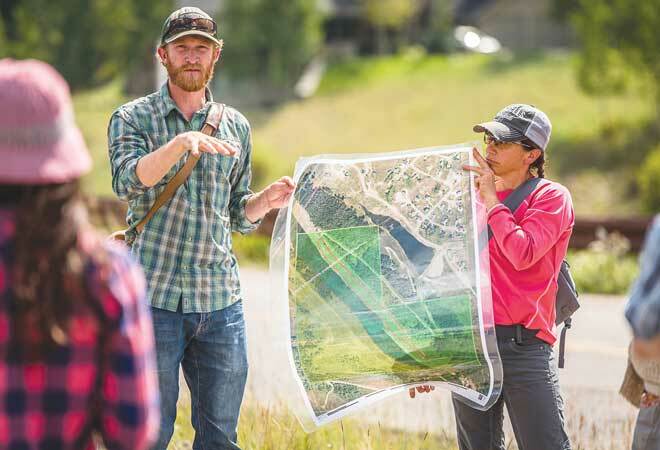 Noel Durant, executive director of the Crested Butte Land Trust, guided the group and explained the Land Trust’s vision for long-term stewardship of the Long Lake parcel. The most commonly used access to Long Lake, Durant pointed out, is on the private property belonging to the Allen family on the north end of the lake. But it is a short, steep trail and Durant described it as “an eroded mess,” having been greatly affected by extended public use. The preferred access is the deeded public parking access starting at the shoulder of Washington Gulch Road, continuing along a county easement for public access across the dam and up on to the forest service parcel. This parking area will be the first point of attention for the Land Trust, as it tries to steer public use more to that location and mitigate use of the Allens’ property. Durant described the need for a trailhead sign to orient people how to access Long Lake from the road, an increase in size, and a reconfiguration for more efficient parking spaces and space for a bus to turn around for a transit stop. “If we are thinking long-term about recreational management of the Gunnison Valley, we think transit is going to be a future for how we can manage the impacts of vehicular traffic while minimizing the impacts of those vehicles going up and down each of these valleys,” said Durant. The Land Trust also hopes to place a restroom facility at the parking area. “We are really trying to look at this as the first intersection with the public of how to responsibly use this resource,” said Durant. The visitors, guided by Durant, continued across the dam bridge, where Mike Fabbre, Mt. Crested Butte water and sanitation district manager, spoke about the proposed arrangement with the Upper Gunnison River Water Conservancy District around pumping and water storage below Long Lake. After taking several questions about future needs for water storage and any plans to improve the dam, the group continued up the trailhead to the lake. There was discussion of different types of recreation allowed, including swimming, boating, fishing, and hiking—all of which will be continued under Land Trust ownership. There was discussion about how much of the recreational use occurs on the other (west) side of the lake. That area is not being acquired, and the Allen family has chosen up to this point to allow the public to use it but is under no obligation to do so in the future, said Durant. “As with [other areas], the question is how we can facilitate public access while protecting the nature of a place,” he said to the group. Bob Gillie, a board member with Gunnison Valley Affordable Housing, spoke briefly to the gathering about how this transaction will also benefit the ongoing struggle for housing across the valley. The Fossil Ridge parcel the land trust will contribute was acquired from Butch and Judy Clark, who transferred the land in 2010 to the Trust for Public Land to hold for future sale to the Forest Service. The proceeds of that sale are required by that agreement to go directly to the Gunnison Valley Housing Foundation. “This will possibly double the money we have for affordable housing. This is a way that the money stays in the valley for a good cause,” said Gillie. With the August 24 tour being very well attended, questions and comments about the process allowed the land trust to gauge public interest and opinion. Durant said overall themes of input were about how the land trust is planning to facilitate public access and how the community will be able to recreate on Long Lake once this transaction is completed. “I thought the level of engagement in this process has been, for me, inspiring. It really shows us that people love Long Lake. We have a really great start,” said Durant.